Sharalin McLeod has accomplished three major goals while at UBC’s Okanagan campus: To be included, to be published, and to graduate. She crosses the stage Thursday afternoon during the convocation ceremonies for the Faculty of Creative and Critical Studies. When Sharalin McLeod began her education at UBC’s Okanagan campus she had three big goals: to be included, to be a published writer, and to graduate with her peers. This week, she will tick the final item off her wish list as she will walk across the stage during the graduation ceremony for the Faculty of Creative and Critical Studies. McLeod came to UBC in 2009 as an Access Studies student with support from STEPS Forward—a provincial initiative for inclusive post-secondary education. Over the past five years, while at UBC Okanagan’s campus, McLeod has become a member of the academic community; attending classes, lectures, and participating in assignments, and social activities. As a participatory auditing student at UBC, McLeod has engaged with the course material, completed assignments, presentations, and exams in more than 20 courses, with a her main focus being in creative writing. McLeod had taken some course at another school, but says she was totally segregated from other students. At UBC she was treated like every other student and raised her hand to ask questions and participated in all assignments and exams. UBC opened other doors for McLeod. Not only did she make friends with her classmates, but she also found volunteer opportunities at countless activities including CREATE New Student Orientations, worked as a marketing assistant for three years with Campus Life, attended several student leadership banquets and conferences, including one in Vancouver, and took on several public speaking roles. Most importantly, she felt like one of the gang. This spring, her second goal was accomplished when a poem she had written was published in the Common Ground, a UBC Okanagan anthology which is edited and published by students. McLeod hopes to be a writer and while she is currently on the hunt for a job, she also spends lots of time keeping up her fiction writing skills as she’s working on a novel. English was her favourite subject and she is thankful to Assistant Professor Allison Hargreaves for all her support. Hargreaves says having McLeod in her class was a joy and a privilege and she treasures the time they spent together. 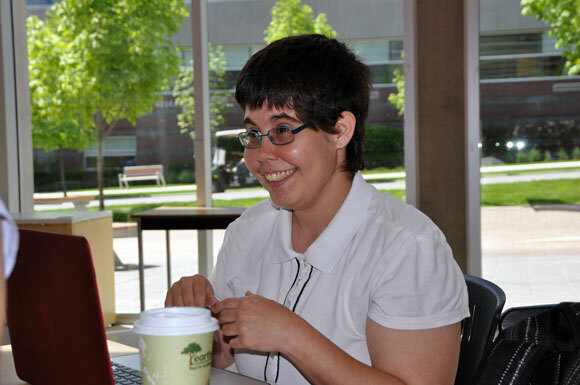 "Sharalin was one of the first students I met when I first began teaching at UBC Okanagan, and I know each of my classes has been vastly enriched by her contributions,” says Hargreaves. “I am thrilled to see her graduate, but admit that I'll miss her lively presence on campus and in the classroom." And that last dream? When you mention Convocation, McLeod grins from ear to ear. She will cross the stage with fellow creative writing graduates in the Faculty of Creative and Critical Studies on Thursday, June 5. Expect thunderous applause from her fellow students, family, and friends.